Ali Momeni was born in Isfahan, Iran and emigrated to the United States at the age of twelve. He studied physics and music at Swarthmore College and completed his doctoral degree in music composition, improvisation and performance with computers from the Center for New Music and Audio Technologies in UC Berkeley. Momeni is currently an associate professor in the School of Art at Carnegie Mellon University and directs CMU ArtFab, co-directs CodeLab and teach in CMU’s IDEATE, Emerging Media, Music Technology and Masters in Tangible Interaction Design degrees. Challenge: To bring an urban animation display to life on the 143-foot high Prison Ship Martyrs Monument in Fort Greene Park, Brooklyn, NY. Solution: Unleashing the creative and interactive capabilities of projectors in public spaces, Professor Ali Momeni and his team used four Optoma X600 XGA 6000 lumen projectors to display giant animations on the prevalent monument and bring hundreds of festival attendees together. Results: Optoma X600 DLP XGA projectors helped unleash interactive creativity at the 2016 Kickstarter Festival. 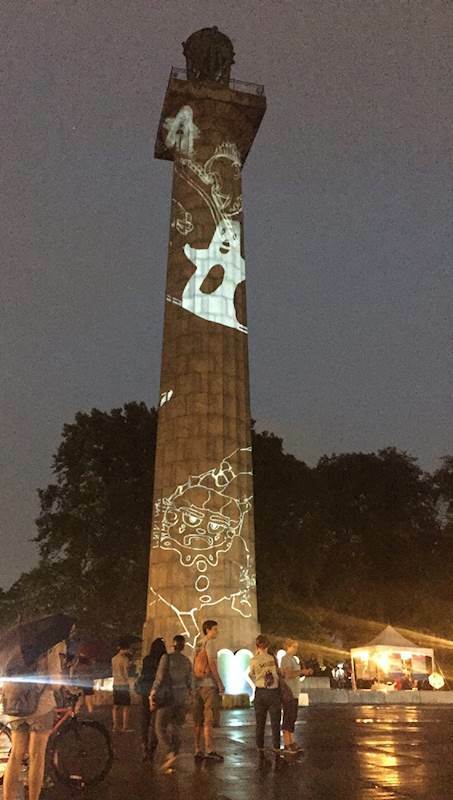 Optoma helped bring to life a crowd-sourced urban animation display on the 143-foot high Prison Ship Martyrs Monument in Fort Greene Park, thanks to the vision of Professor Ali Momeni during the 2016 Kickstarter Festival in Brooklyn, NY. Momeni and his team invited more than 400 festival attendees to use their imagination to create unique drawings of statue-like figures – to be displayed on the statue. Using Dranimate, an interactive gestural animation system developed at Carnegie Mellon University, they transformed the drawings gathered from the attendees into gesturally controlled virtual puppets. “I am very interested in how you can use the video medium to bring people together in public spaces, and like to rely on people to create the content as opposed to doing pre-rendered material,” noted Momeni. Fort Greene Park, unleashing the creative and interactive capabilities of projectors in public spaces. The display brought together hundreds of festival attendees who were able to see participants puppeteer their own drawings. With 6000 lumens of brightness, the Optoma X600 projectors lit up the landmark in outdoor ambient light, while also providing excellent connectivity and robust performance for the outdoor venue. “When considering dollars per lumen, the Optoma X600 is exceptionally bright, making it the perfect projector for large installations, any large venue or conference room,” said Brian Soto, Head of Product Management at Optoma. This project celebrated the publication of Momeni’s Manual for Urban Projection, a Kickstarter funded project and was among the approximately 20 different Kickstarter funded projects that participated in this festival. Momeni is a professor in the School of Art at Carnegie Mellon University and directs Carnegie Mellon University ArtFab – a cross-disciplinary facility dedicated to research in the intersection of digital and physical media and its techniques. He has been active in the audio and projection world for 10 years and has a passion for creating participatory experiences in public spaces engaging in art, design and storytelling.